Dubai: Being in close proximity to passengers on a flight can be reason enough to raise anyone’s anxiety. A teenager, however, had the a flyer’s worst nightmare when she was seated next to a man who quickly started harassing her. 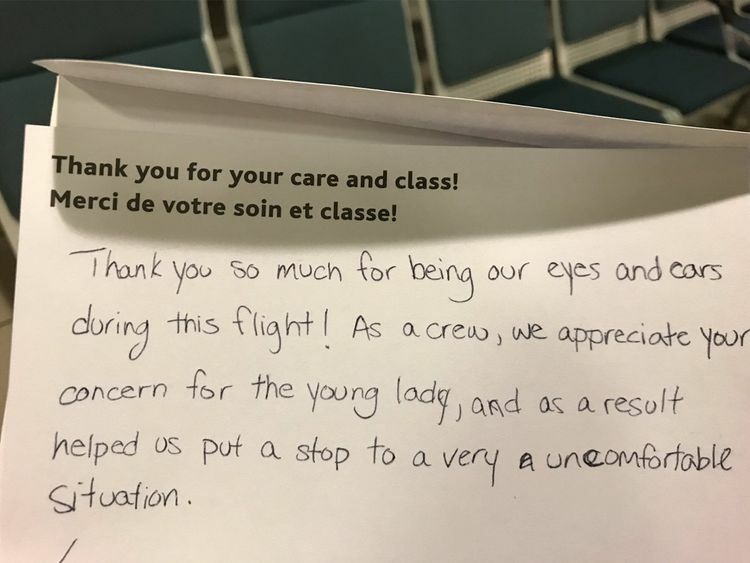 An account on Twitter by Canadian journalist Joanna Chiu has gone viral as she laid out the sequence of events unfolding on a flight from Toronto to Vancouver. In a series of tweets, Chiu spoke about how she was excited to get a whole row to herself on the flight. However, a conversation happening in the row behind her caused some worry. “A man appearing in his late thirties was obviously delighted to be seated next to a teenager separated from the rest of her family. He started off by asking about her career plans and laughed when she said she wanted to be CEO and kept giving her ridiculous advice. She was friendly and he seemed to take that as a welcome cue to get very familiar and started teasing her and kept saying that he wanted to take her out to eat, which she was ignoring. At this point I had to stay awake in case anything went further than that,” she tweeted. What made her snap was the man asking for a “dirty” photo from the girl. “I turned around and rage-whispered exactly what I thought of that and he didn’t say anything back and went off to use the washroom,” she added. That was when another woman on the flight also stepped in to support the girl. When a flight attendant was called to register a complaint, she carried out the necessary investigation and asked the man to change seats as he returned from the washroom. The account has been shared over 100,000 times on Twitter since March 25 and many men and women shared their own experiences and discussed ideals ways to intervene and call out sexual harassment, especially while flying. Chiu also spoke about her own experiences as a young flyer facing harassment from other passengers and many users shared experiences they or their children had, where they did not receive any help or assistance. The tweets ultimately led to a public conversation on the ideal ways for bystanders to help in such situations.